The most definitive message broadcasted to me from Sesame Street was to recycle and conserve resources (turn out the lights when you leave a room, turn the water off while brushing your teeth, turn baby food jars into rainy day fund coin banks and snow globes (that was actually a craft from American Girl magazine, which as I recall was way complicated and expensive to craft)). Then, somewhere, in my post-Big Bird days, the term “upcycle” entered my vocabulary as a sub-category of the general act recycling. To upcycle, means to turn something into something else, often by hand (ie not bags that are processed from once plastic water bottles). While the actions behind this term (still, unrecognized by Microsoft Word, which goads me to replace the word with “upchuck”. How lovely.) are not new or revolutionary, it does take more time, thought and energy to upcycle than it does to plain old recycle (ie, throwing those plastic bottles into a bin to be re-purposed into a non-plastic bag in a factory somewhere). I’m guilty of taking the lazy way out; I buy instead of upcycling. Take for instance, my latest obsession with knitting. After two trips to JoAnn’s I have a surplus of skeins of yarn that don’t seem to budge no matter how many times I weave those needles together. At some point in time I will finish these projects and hang these scarves inside my coat closet amongst the surplus of winter accessories that call my closet home – 98% of the time. (I admit: I’m a stuff-a-holic. I love things. Especially, things you can wear.) Sure I’ll wear them proudly for a week, but then what? Etsy? Will someone out there buy my one-offs? Likely no, as I am no expert and as I have the hardest time releasing my homemade affairs (see parenthesis above). The lesson in this less-than Aesop’s story is that I could have easily torn apart a sweater I bought in a Prague thriftstore, which I love dearly, but could never wear for it shows it’s wear too easily after all these years of loving. The threads are ripe for the pulling. Having realized (and published) this notion, it’s sure to be my next knitting project. I also am a hoarder of papers, of all sorts. I remember when one of my friends came to visit me while I was studying in Prague. She, from Hong Kong, had been traveling throughout Europe before coming to Prague, her last stop. As she was, and always will be, a frequent traveler, she was less interested in touristy souvenirs, and as a graphic designer, was especially interested in flyers, newspapers… paper. After her two week stint in Europe, she was prepared to buy a new suitcase. For paper. I laughed. Five months later, when it was my turn to stuff my European experience into two suitcases, I nearly cried. I literally spent hours on the floor sorting through papers that held so many memories (the flyer from my first Czech discotheque, the weekly magazine that struggled so hard to reach it’s English-speaking consumers that every sentence was a goldmine of laughs). Finally, having reached the scale’s tipping point, I settled for the best (and 1/10th) of my paper souvenirs. Today, most of those cherished memories sit in a box in my parent’s house, others have made it into a series of framed collages that sit, collecting dust, until I have twenty times the space I have today to hang them. And yet, with all these useless mementos around, there is always the need to purchase useful things. The ability to marry the loved with the functional eludes me often when I craft (I’m going for museum pieces after all, not an Ikea cup!). It does not allude the fine purveyors at this year’s Collective Upcycle, a holiday pop-up shop in Shaker Square, just south of my abode in Cleveland Heights. The store opens tomorrow evening through December 24th and judging from the photos moving through their Facebook page’s photo stream, there are some mighty clever artists in the bunch having crafted everything from hats to bags to greeting cards. I’m excited to attend the event, to stumble upon that perfectly unique gift, to help out a fellow artist and Cleveland resident, and most importantly, to be inspired to upcycle more in my own work so that someday I may join the ranks of those who will show of their wares this season. 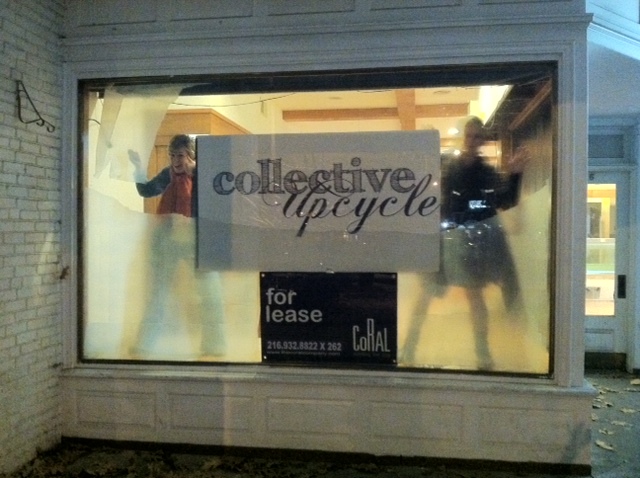 Collective Upcycle is a pop-up boutique of reused art & handmade goods by Cleveland artists. The boutique brings together 30 -40 Cleveland-area artists & innovators who repurpose existing resources & leftover materials and transform them into something new, functional, beautiful, or whimsical. In an enthusiastic demonstration of Cleveland’s bustling creative reuse economy, you’ll find repurposed jewelry, tote bags, flowers, furniture, candles, decorations, photo frames, stationary, wind chimes, magnets, accessories, art and more in Collective Upcycle. Our boutique roams around the city and pops up in different neighborhoods of Cleveland. I love your posts. I love this one especially.